The very tentative attribution to the palace workshops has been based on two factors: the hollowing, which is otherwise excellent but leaves an exaggerated depth of base (here 0.86 cm), and the speckled and slightly flawed nature of the material. The former is apparently a feature of the palace workshops (heavy bases provided a measure of stability for bottles placed conveniently about the quarters of the very important people who received them) and court use of material that was not inherently valuable seems to have been a standard for the mid-Qing period. The court received a great deal of its material as tribute, particularly after the conquest of Turkestan, when a massive quantity of nephrite flooded into the court twice a year, and that material would have varied greatly in quality. It has two ways of disposing of lower-grade nephrite. It could sell it to the private market through various offices of the Imperial Household Department: for example, the salt administration offices, silk factories, and custom houses in Jiangnan bought over 2,600 catties of second- to fifth-grade jade from the palace in 1804 (Kim, pp. 266 – 267). Or it could have used it to make small objects, such as snuff bottles, which could be used as gifts for the endless nobles and bureaucrats, scholars and sages, and others to whom gifts had to be given on regular occasions to mark specific festivals, or as indications of imperial favour at other times. If the emperor was content to use a wide range of qualities of nephrite, they might all have been carved with equal skill, since the material would have no bearing on the payment received by the workers. 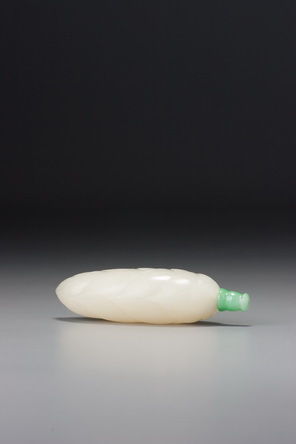 Many a stunning piece of jade might inspire particularly artistic work, but given a lesser piece of material, the opposite would not automatically obtain. After all, fine palace jade pieces could also be sold: in 1780, the Imperial Household Department sold a large amount of jade articles from the palace at the Chongwen Gate for 16,323,717 liang of silver, a considerable sum (Kim, p. 266). The carving here is not only superbly done as both overall sculpture and detail, it is also very cleverly devised to disguise the texture of flaws in the material with a lot of surface detail and changes of plane. A naturally rather formal subject is subtly relieved of its absolute formality by the detailing of the narrow sides, where the tips of the leaves of the shoot are curved very slightly either to one side or the other. It is another of those subtle-but-masterful touches of inspiration that so often separate great from run-of-the-mill art.